In a large saucepan, over medium heat, add the oil. In a mixing bowl, combine the meat and season with salt and pepper. In a separate bowl, add the whole tomatoes and crush with your hand. Add the meat to the saucepan and brown for 4 to 6 minutes, stirring constantly. Add the onions, celery, and carrots; continue to cook and stir for 4 to 5 minutes. Add the garlic and tomatoes and cook for 3 minutes. Whisk in the tomato paste, 2 cups of the beef broth, and brown sugar. Add the thyme, bay leaves, fennel seeds, oregano, basil, balsamic vinegar, and red wine. Mix well. Bring the liquid to a boil then reduce the heat to medium/medium-low and simmer for 2 hours. Stir occasionally and add more liquid if needed. During the last 30 minutes of cooking, season again with salt and pepper. In a large pot, cook the cavatappi pasta until al dente. After draining the pasta in a colander, add the pasta back to the pot along with 4 to 6 cups of the prepared meat sauce. 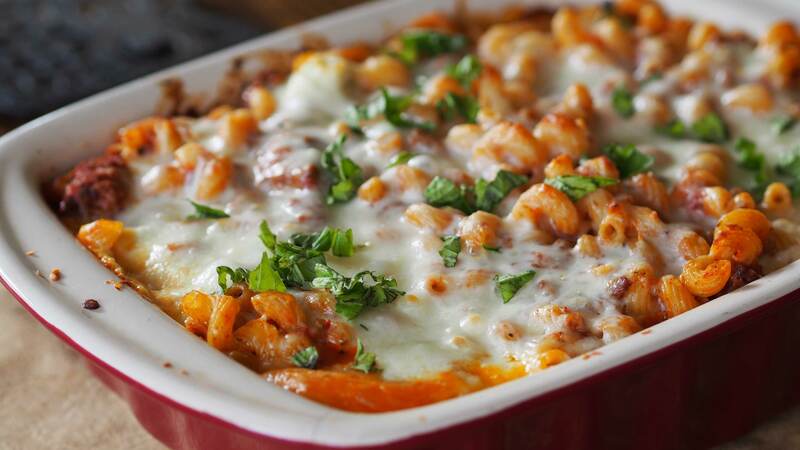 Pour mixture into a 9 X 13-inch casserole dish and top with mozzarella and parmesan cheese. Cover casserole dish with aluminum foil and bake in preheated oven for 30 to 40 minutes. Remove foil from dish during the last 10 minutes of cooking time. Before serving, garnish with basil.